COLUMBUS, Ohio — For as much as fans thrill to the memorable upset, the NCAA Tournament is filled with many more routine routs of the sort witnessed Sunday at Nationwide Arena. 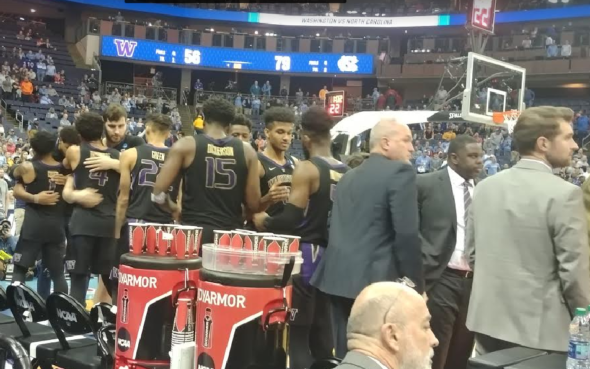 What was learned in this weekend sojourn to the Midwest was how far the Washington Huskies have come and how far they have to go. In two years, they went from the worst to the best in the Pac-12 Conference. They made the tourney for the first time in eight years, won a game, yet barely drew closer to the national pinnacle, which was represented by the large, swift persons employed by the University of North Carolina, the Midwest Region’s No. 1 seed. The wire-to-wire, 81-59 blasting (box) was no surprise. Carolina led the nation in rebounding margin, and showed why. It had 48 to Washington’s 24 (15-8 offensively). UNC had much experience in finding the soft spots in UW’s famed zone defense. And the Tar Heels’ defense made a Washington weakness, outside shooting, weaker. UW missed 20 of 29 three-point attempts. None of this was a surprise. The surprise came in getting to this day, the chance to play the best on the big stage, just two years into coach Mike Hopkins’ tenure. “When you’re building a program, you get a lot through experience,” Hopkins said. “And to be able to win a game (78-61 over Utah State Friday night), to feel it . . . you walk out on that stage, it’s pretty big. I’ve seen it a lot. Our guys haven’t. But that was the Mountain West champions going against the Pac-12 champions. That’s a level up. As was UW going up against an Atlantic Coach Conference powerhouse. Perhaps the worst of it was the numerous times the Tar Heels beat Washington down the floor after made baskets. Every time the Huskies looked to rally, Carolina would conjure a momentum-killing breakaway score. None of these things are strategic failure by the coaches. It’s pure athleticism. It’s all about getting the biggest and best. Hopkins has had two well-regarded recruiting classes, and that was with little tangible proof that the methods of the first-time head coach worked. Now he has a sort of hoops talisman — a tourney appearance and a win. He’ll need to do another makeover. He’s losing starting seniors Dickerson, Thybulle and David Crisp, and reserve Dominic Green. He also may lose sophomore guard Jaylen Nowell, who led the Huskies with 12 points, to the NBA draft, although nothing has been said publicly. Is it possible to build a powerhouse at Washington? The answer for the longest time has been no. The farthest they reached in the modern NCAA tourney is the round of 16. Marv Harshman got there in the 1980s, as did Lorenzo Romar in the Aughts. But Hopkins is a rare dude, a high-energy coach with a clear plan and a charming eccentrism that has endeared him to his players. From all available evidence, trust in him is complete. But the UW took care of a related problem this week when it gave Hopkins a raise and contract extension, securing his services against predation by the consiglieres of the larger basketball-mafia families. Thybulle has been practicing with some of the newcomers who have yet to dress for a game. He’s been impressed. In defeat, the words sounded almost ominous, like something a hopfather might say. The Huskies had an exciting season. 27-9 is one of their best records in history. Bravo. But, UNC and Oregon were 20 points better. A long way to go, indeed. I’m looking forward to what Hop will put on the floor in 2-3 years, as it will be quite a transformation. He is the real deal and most important, the kids have bought in. He’s got a group of youngsters that were hard in practice on the seniors. They did great. As did my Anteaters. All is well with the world. Hope the Zots make it to Hec Ed. I think they were there some years ago. I only wish the coach hadn’t embarrassed himself and the program. He had a pretty bright future – even mentioned for the UCLA job – but not any more. Juvenile, out-of-touch, homophobic, misogynistic behavior at its worst, straight out of the Bobby Knight playbook. The future is bright. Seattle is a hoops hotbed. Romar recruited Final Four level talented teams, the Brandon Roy and Isaiah Thomas teams were stacked, but X’s and O’s always let them down. Hopkins is proving he can recruit on that level, the difference is that he can also coach. Seattle U…that other D-1 program…. needs a home. They’ll have a hard time filling Connolly. Tsk, tsk…it’s the Redhawk Center. Connelly was demoted along with Christopher and Pluto. Romar got rid of his coaches, and replaced them with recruiters. True. The biggest graduation loss was Ken Bone. I think we’ll Hopkins can recruit anyone, anywhere, especially now that he can offer evidence of the uptick. The eye test is strong, as will be word of mouth. Chatting with players in Columbus, I learned they are his biggest boosters. The key phrase in this piece is “. . . large, swift persons employed by the University of North Carolina” in the fourth pargraph, with the emphasis on “employed“. I’m not necessarily accusing NC of violating any ethical rules, but when a school perpetually gets the best recruits, something smells fishy. We’ll see how they fare against other big boys.